I do many kinds of repair work. The main goal is to accommodate my clients’ needs and to satisfy their requirements. The second, equally important goal is to work to professional standards. If the goal is to fix an old window “well enough to serve,“ then totally rebuilding it probably isn’t justified. Examples might be a damaged window in a church, which can and should be repaired in place, or a recently purchased antique, which “just needs a little work.“ In such cases we try to do the work efficiently, to save the client money. I will most likely be concerned with physical and mechanical issues first. If there’s a wooden frame, I’ll make sure it is stable and safe to carry the weight. Or, I’ll make a new frame in my wood shop. 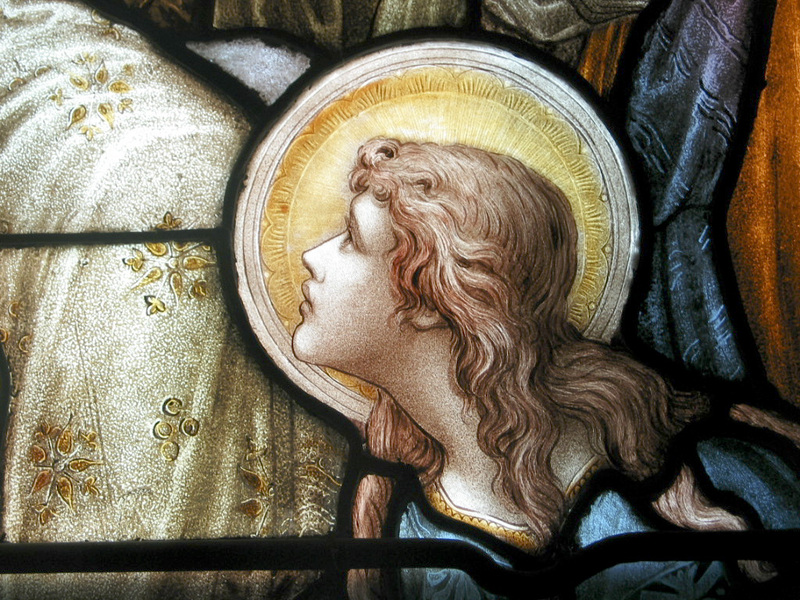 Then I’ll look at issues like replacing broken or missing glass, using my inventory of more than five hundred types of opalescent, cathedral and blown antique glass. Most often an approximate match will do, to save the cost and effort of finding a perfect match. We fix a lot of buckling windows. Gravity and the passage of time cause many old windows to move out of plane, and for large windows this can be the start of bigger problems. We make new steel bars and supporting hardware to install in many old windows. Simple cutting, drilling and welding jobs are handled in our own shop, and we send more complicated parts out to be fabricated by our local blacksmiths and machine shops. We also do museum quality restorations in my studio. 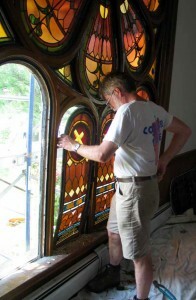 To fix a valuable antique, such as a lamp or a window by Tiffany Studios or and old Frank Lloyd Wright window is altogether different from repairing a more common object. I have to use a much higher standard of care. The need is threefold: to preserve the thing and make it useable, to keep its resale value, and to end up with a repair that nobody will notice. First I have to match broken or missing glass, which can be a very tricky business. Despite having a huge inventory of glass of many textures and colors, often I have to search many sources to find the perfect match. That can take months! 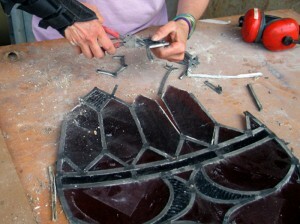 Having almost forty years’ of relationships with suppliers and manufacturers of glass helps a lot. Then I have to figure out exactly how the piece was made, to deconstruct it mentally and to decide what soldering, etching, or painting technique the original maker used. Then finally I must duplicate those techniques, along with whatever finish, polish or patina the original work had. We also bend glass for lamps, with a process called slumping. That usually involves making a mold of high-temperature refractory material and heating flat glass in one of our electric kilns to temperatures of about 1,200 degrees Fahrenheit. The kilns are also used for painting, a process that involves about six basic glass paint colors and about fifty secondary ones. Paint is applied with a variety of brushes in successive layers, each one fired in the kiln. 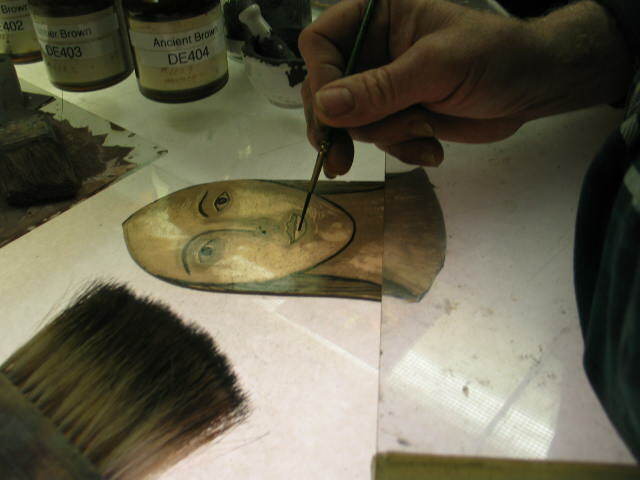 Faces, hands, details of drapery and background are commonly painted by hand, but we also employ stenciling and silk-screening techniques where they are appropriate for painting repeating patterns. Fortunately, I enjoy a challenge; such work is only a part of my day. You must make an appointment or call ahead if you are bringing in an item to ask for a repair estimate. The volume of shop work that we are currently handling makes it impossible to guarantee that we can make estimates on a walk-in basis. If you show up without calling head, you will be asked to fill out a 'request for an estimate' contact sheet and will be required to leave your object with us until we can get back to you with an estimate. Thank you for your understanding.